Canada’s good fortune in escaping the last Great Recession relatively unscathed is turning into a curse. Canada’s well-regulated banking system with its greater reserve requirements and less entanglement in the global financial mess than the U.S. and European banks insulated Canada from global ills that forced economic self-examination on other countries. Furthermore, Canada neglected to plan for its future by leaning heavily on two sectors: petroleum and overseas hunger for the Canadian real estate bubble. Since the Great Recession, Canadian consumer debt rose to record heights and Canadian real estate grew into bubble territory. Before, China’s economy was growing. Now it’s slowing. OPEC kept oil prices high. Now they’re in free-fall. Iranian sanctions kept oil off the market. Now Iran is pumping oil again. Chinese ‘hot’ money was buying Canadian real estate. Now China is clamping down with currency controls. And, now the chickens are coming home to roost as you’ll see below. Regular readers may remember me referring to the Baltic Dry Index (BDI) of global raw material shipping prices as a reliable leading economic indicator. The BDI is considered a leading indicator for economic activity because the materials used in the index are pre-production. They indicate industrial and, ultimately, consumer demand and are not subject to government manipulation. The BDI reached over 11,000 prior to the Great Recession, has fallen to 310 in the chart below and has recently dipped to 303. That’s the lowest it’s ever been. When global economies are booming, BDI shipping rates are high. When global economies are hurting; the BDI crashes as in the above chart. As a leading economic indicator, the BDI now heralds very tough times ahead world-wide. Although the U.S. is by far Canada’s largest trading partner, China’s insatiable demand for commodities kept global commodity prices high thus benefitting resource-exporting countries like Canada, Australia, Russia, Brazil, etc. However, China’s economic slowdown has reduced their demand for commodities and commodity prices haven’t found a bottom yet. Among the hardest hit commodity-producers, “Brazilian courts granted more than 5,500 bankruptcy filings in 2015, the most since 2008.” There are concerns Rio may not be ready for the Olympics this summer. In any case, 2016 will be a world of pain for the rest of the commodity producers. Companies are also hurting. Although BHP Billiton Ltd. and Rio Tinto “have been able to withstand the [iron-ore] price slump and are returning multi-billion dollar profits even at current prices”, but others like Anglo American are bleeding from the commodity over-supply and that is dropping commodity prices. Over-supply cannot be turned off quickly. It is costly and time-consuming to close and decommission a mine. First Moody’s, then Fitch Ratings cut Anglo’s credit assessment to junk while Anglo tries to sell its money-losing iron mines. Ironically, Anglo plans to ramp up production at its new and over-priced Minas Rio mine to make it attractive before selling. “For iron ore, the glut could get even bigger. As much as 266 million tons in new production will be added over the next three years before supply is curbed from 2019,” according to Bloomberg Intelligence. Don’t hold your breath waiting for China’s economic recovery. Dr. Harry Broadman, the director of the Council on Global Enterprise and Emerging Markets, says China has serious structural problems. “What is driving the problems in China is systemic, stemming from basic contradictions in the fabric of the economy that continues to pursue … a socialist market economy. If you think about the juxtaposition of those two words, they end up themselves in a contradiction.” Those contradictions are increasingly on display. The average Chinese new to the stock market lacks the understanding that money is lost when stock markets fall so the government, relying heavily on social security, uses a sledgehammer to prop up share prices, changing the rules and making it up as they go. As I’ve said for years, the Chinese Communist apparatchiks are proving once again that ‘command economies’ are the road to ruin as proven by the Soviet Union, Cuba, North Korea and Venezuela. Unencumbered by these lessons from history, the world’s Central banks have also hit the same road with their manipulated interest rates. I mean what unfettered moron could believe that negative interest rates will cure anything? They’re a sign of failure! Look out below as we continue this relentlessly grinding economic collapse as demonstrated by Japan recently implementing negative interest rates. And, again demography is overlooked. Although China rescinded their ‘one child policy’, the economic consequences will be significant. In Chinese families, it’s the children, not the state that looks after parents and grandparents. Sole Chinese children without siblings cannot afford to support so many aging relatives. This income/care gap will also delay China’s economic recovery. According to the Globe and Mail “Canada’s economy is directly affected by what is happening in China, where a weaker appetite for resources is depressing prices for oil, coal, copper and many of the key commodities that dominate this country’s exports and investments. “Bank of Canada Governor Stephen Poloz says Canada is facing a long and painful fallout from a “seismic shift” in global resource prices that could last up to five years and drain $50-billion a year from the economy. The downturn in the mining industry “wiped out more than $1.4 trillion of shareholder value by digging too many holes around the globe. The industry’s 73% plunge from a 2011 peak is far beyond the oil industry’s 49% loss during the same time” according to MineWeb. Anglo American CEO Mark Cutifani expected 2016 to be the most challenging year for the mining industry, warning that things could get worse before getting better. Investors should also be aware that Mining Weekly forecasts that distressed mining assets will drive 2016 mergers & acquisitions activity. According to MineWeb, “This doesn’t come around very often, maybe every 15, 20 years.” In every crisis, there is opportunity. 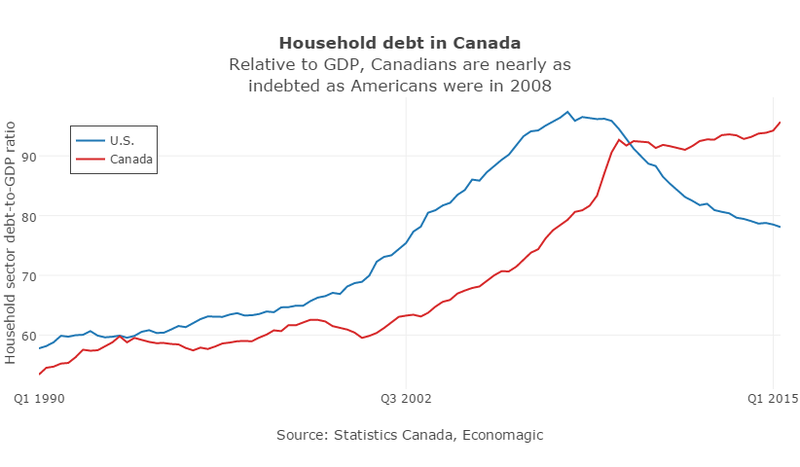 According to Pinnacle Digest, “The chart above documents household debt up until 2014. Regrettably for Canada, things have only gotten worse since. On January 19th, it was reported that household debt reached approximately 171% of disposable income…” This is higher than Amerikan household debt before the Great Recession hit the U.S.
Old chart only goes to Q1 2015. Canadians (red line) have since surpassed Amerikans. The Parliamentary Budget Officer (PBO), the government watch-dog, warned that “Based on PBO’s projection, the financial vulnerability of the average household would rise to levels beyond historical experience.” The PBO expects interest rates to rise and forcing Canadian households to pay more than ever toward working off record debt loads. Stay tuned. 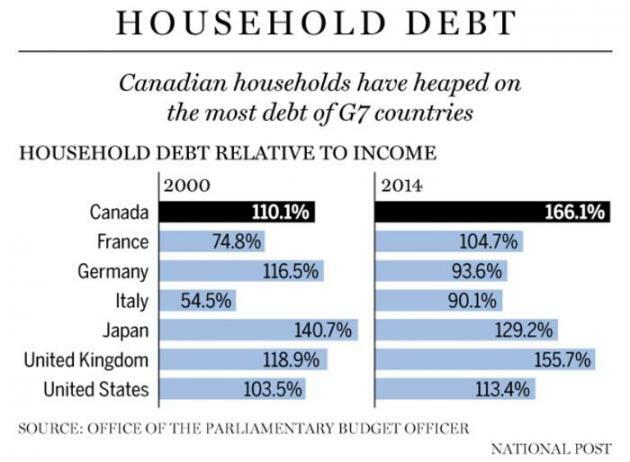 Canada’s national debt is about to skyrocket, too. Canada’s newly crowned Prime Minister is about to embark on an unprecedented government spending spree. Lest there’s anyone who still thinks Canadian money is backed by gold. It’s not. According to Max Keiser, Canada’s gold reserves shrunk to 3.4 tons under Stephen Harper, but Canada’s new Prime Minister Trudeau (T-2) sold half of that and Canada is now down to 1.7 tons. Compare that with 8,000 tons that the U.S. (supposedly) has (had? ), the 1,700 tons China has (probably much more) and the 1,023 tons of gold reserves Canada had in 1965. Canadian money is largely based on the full faith and confidence in our politicians. This entry was posted in Collapse 2016, Economic Collapse and tagged Baltic Dry Index, Canada, China’s Slowdown, commodities, debt, demographics, Japan. Bookmark the permalink. “….Canada’s well-regulated banking system….” (!). Really? The data provided by the Canada Mortgage and Housing Corporation, the Office of the Superintendent of Financial Institutions and the Canada’s big banks themselves, showing the financial support for Canadian banks (i.e. bailout) from various agencies was about $114 billion dollars. That about seven per cent of Canada’s gross domestic product in 2009. (David Macdonald. “Big Bank Secret”, April 2012). I don’t agree with you about BDI. Everyone seems to predict some world trade crisis and near global economy slump, but not many analysts talk about the real reasons why the this indicator is so low. Maybe my article will change your mind about what BDI has to tell about the future. I read your article. Very interesting! Old paradigms no longer work, yet we keep trying to use them. I no longer put much stock (no pun intended) in stock market valuations and as comparison to BDI or anything else for that matter. As a long time trader, I know stock markets are rigged and manipulated. Both of my favorite technical analysis tools; candlesticks and Bollinger Bands are virtually useless because markets are so distorted. I also included the Cass Freight Index (North American trucking) and Otterwood Capital (railroad) all of which are in decline so the BDI is not alone. I’ve recently read that new truck orders have plunged and distillate volume is also dropping (gasoline, av gas, kerosene, etc.) and, as this is declining downstream final demand, it helps explain the drop in crude oil upstream demand. Ships sit idle in their ports and orders for new trucks, rail cars and tankers as well as construction and mining machines are hitting record lows. Look at the pain bell-weather Caterpillar is having. So which is it? It can’t be both. If we’re tightly connected then adverse conditions affect everyone to a much larger degree now than before globalization. You say the drop in the BDI heralds global growth within 3 to 4 months. However, that too is an old paradigm. As I said, nothing works anymore. Let’s revisit this in a year’s time. I expect some very unpleasant conditions. I hope I’m wrong, but hope is a feeling, not a plan.